Armed with a needle and thread, Dr. Elizabeth Chabner Thompson created a fashionable line of bags, bras and accessories for breast cancer patients. 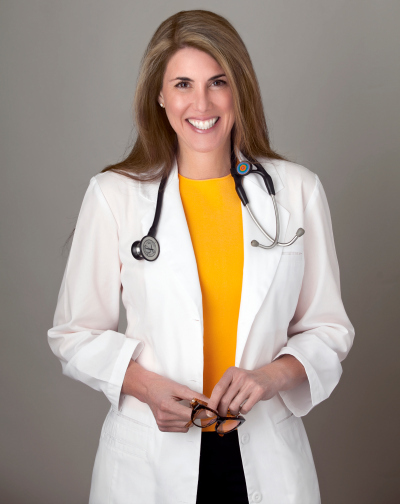 Meet this amazing physician-entrepreneur and find out how her company, BFFL, enables her to help women on their journey through the breast cancer experience. Very early in her medical career, Dr. Elizabeth recognized the need for recovery products that did not yet exist. "Many pa­tients felt that they weren’t sent home from surgery with the supplies and instructions they needed to make a full recovery." "My mother was 49 when she found a lump in her breast." In her last year at Johns Hopkins Medical School, Elizabeth had just been matched with a West Coast hospital for her residency when her mother revealed that she had breast cancer. Elizabeth was there for her mother's mastectomy, staying with her in the hospital and caring for her wounds. "The hardest part of her surgery was taking down the bandage for the first time," admits Dr. Elizabeth. "She just couldn't face it, so she closed her eyes and I took the bandage off. It was really traumatic." Elizabeth made the decision to devote her career to helping people with cancer — little did she know where this would lead her. "I was petrified of developing breast cancer." Elizabeth had to consider her own cancer risks. Her mother, grandmother and great-grandmother had breast cancer, so her risks were high. "I had years of surveillance and biopsies where I worried for days," she recalls. "I just could not imagine how I could get through breast cancer with four children, work and managing our lives." Elizabeth spoke with genetic counselors and many surgeons before she committed to having prophylactic mastectomies. "I am so relieved that I made the decision to have the surgery, but it's not right for everyone," Elizabeth revealed. "Your body is never the same after surgery. Contrary to what many people think, it's not 'just cosmetic surgery.'" Fortunately, Elizabeth's procedure went smoothly, and it taught her a great deal about the challenges faced by women recovering from breast surgery. "I had a smooth recovery because I was prepared." As a physician, the daughter of a breast cancer survivor and a woman who has undergone breast surgery, Elizabeth knew how to prepare for her experience. Sadly, most women do not. "Many women have no idea what to bring to the hospital or what they will need at home." For her mastectomies, Elizabeth had "all the supplies and toiletries" packed long before the day of surgery. "The physicians who operated on me convinced me to take a second part-time job navigating their patients through the decision and recovery process. I loved helping other women in my same predicament," says Elizabeth. "I created a 'tip sheet' that I would email to women going through the procedure," explains Elizabeth. "The tip sheet helps them cross 'pack for the hospital' off their lengthy to-do list." "This labor of love was how the BFFLBags® started." Before long, Elizabeth found herself in her basement packing recovery bags, containing many of the items on her tip sheet. Each bag included things such as a pillow to put under the arm, toiletries, wound care products and sheets to organize appointments and instructions. "When my colleagues began asking me to do the same for their patients, I realized my idea was scalable," says Elizabeth. With the encouragement of her husband, Elizabeth dipped into their savings and started BFFL Co. "I realized that as a physician I could help 50 patients per week, but as a business person, I could help 500," says Elizabeth. 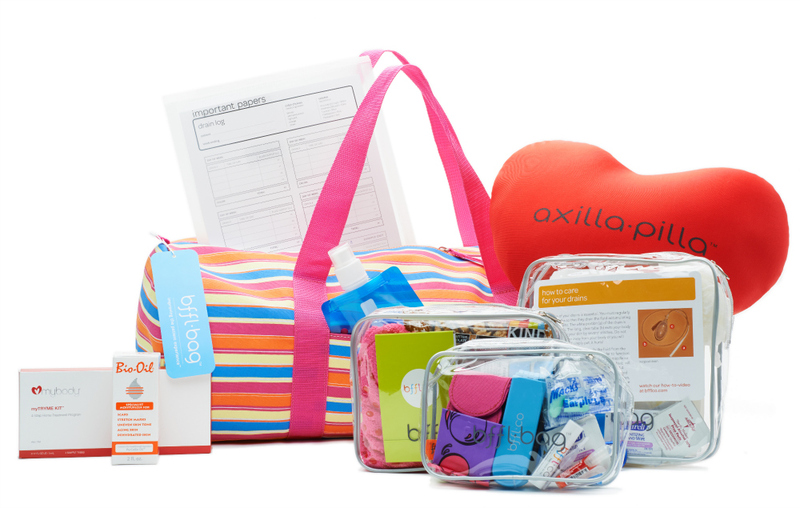 "My first product was the Breast BFFLBag®, a brightly-colored striped duffel filled with recovery and comfort products to help women facing breast cancer surgery." After the BFFLBag® was created, Elizabeth turned her attention to surgical and recovery bras. She "was always searching for something comfortable" for her mother to wear after her mastectomy. "It got me thinking that so many patients are in the same boat," says Elizabeth. "Women complained that they could not find a comfortable bra to protect areas that were tender and irritated from breast radiation treatment," explains Elizabeth. "The elastic pinched the underarm drains that exited the body after surgery and caused more discomfort and complications than the surgical incisions themselves." It amazed Elizabeth that women would undergo a "$25,000 cutting-edge surgery" and then be put into a "1970s nylon-corset bra." The ambitious doctor-turned-businesswoman set a goal to make a better surgical bra designed to keep pace with the progressive surgeries. Elizabeth spent hours cutting up sports and medical bras and sewing prototypes on her home sewing machine. "My designs had openings and tabs in new places and were made of technical materials that were soft and comfortable yet extremely functional." BFFL Co. now offers several styles of surgery and recovery bras. "I am most excited about our Elizabeth Surgical Bra," gushes the entrepreneur. "It simplifies things for doctor, nurse and — most of all — patient." BFFL stands for "Best Friends for Life" because "it’s all about friends helping friends with both the medical and non-medical part of recovery." All of the BFFL products are designed to improve the patient experience and help patients recover. "The healthcare industry," says Elizabeth, "is slowly but surely realizing the importance of proactively making recovery easier on the patient, the family, the physician and the nurses." And for that we say: Thank you, Dr. Elizabeth Chabner Thompson. Visit BFFL Co. on Facebook and find their fabulous products on the BFFL website.